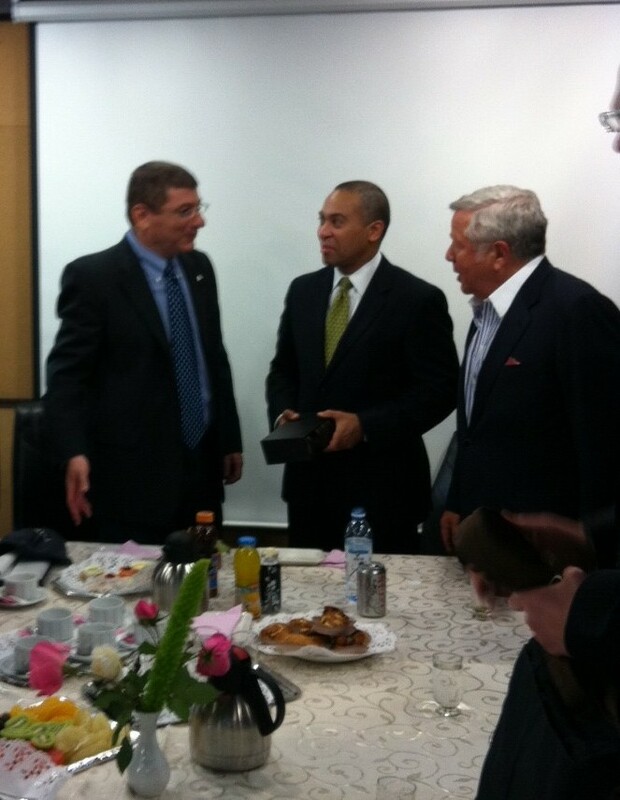 Today, at the start of the Massachusetts – Israel Innovation Economy Partnership Mission with Governor Patrick, our first meeting of the day was with the CEO of El Al Airlines, Major General Eliezer Shkedi. A small group of us met with the General and his staff to pitch having El Al open non-stop direct flights between Boston and Tel Aviv. If there was one single action that could directly affect the growth of new Israeli businesses in the Commonwealth, it would be the convenience of direct flights. Boston is already the second largest origin-destination, business market without nonstop service and Massachusetts ranks 5th among U.S. states for air exports to Israel. With the ties that we share with Israel in the High Tech, Life Sciences, Finance, and Higher Education sectors, our shared economic future is certain to support this important service. Companies like EMC, Cubist, and Glasshouse Technologies all indicated their company’s strong interest in supporting direct flights. Robert Kraft made the obvious statement that non-stop flights are not only good for their business, they would be profitable for El Al, with higher paying business passenger revenue. Governor Patrick proposed that both “sides” have their staff work on the numbers over the next six months and reach a decision about the feasibility of these flights. General Shkedi agreed to see if it can work. Right now, El Al is considering non-stops to Miami and Chicago. We might not be able to compete with the large Jewish population in South Florida, but we should hold up well with Chicago, especially with El Al’s partner airline’s (Jet Blue) major expansion in Boston. Who knows, in a year or two, sitting on the tarmac in New York may not be necessary to get to Tel Aviv. This entry was posted in Economic Development, Transportation & Infrastructure and tagged Massachusetts Innovation Economy Partnership Mission to Israel by Tamara Small. Bookmark the permalink.